SlicePipe is an angular Pipe API that belongs to CommonModule. SlicePipe creates a new array or string from the given array or string respectively. Slice pipe uses slice keyword with pipe operator. Find the syntax. 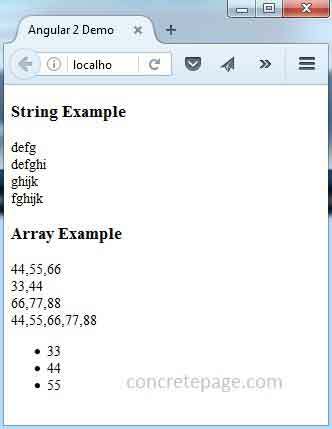 array_or_string_expression : Expression that will result into an array or a string. This result will be input for slice pipe. slice: SlicePipe API uses slice keyword with pipe operator. start: Starting index to slice given array or string to return as subset. 1. If start index is positive, slice pipe will return the elements at start index from start and the elements after in array or string expression. 2. If start index is negative, slice pipe will return the elements at start index from end and the elements after in array or string expression. 3. If start index is positive and greater than the size of string or array expression then slice pipe will return empty. 4. If start index is negative and greater than the size of string or array expression then slice pipe will return complete array or string. end: Ending index to slice given array or string to return as subset. 1. If end index has not been provided then slice pipe will return elements till end. 2. If end index is positive then slice pipe will return all elements before end index from the start of the array or string expression. 3. If end index is negative then slice pipe will return all elements before end index from the end of the array or string expression. Suppose expression is a string as given below. We have given a number per character to our input string to understand start and end index. Index starts from 0. 1. Find the slice pipe with positive start and positive end index. In our example we have following indexes. Slice pipe will return substring starting from index 3 i.e character d and will include all characters before index 7 i.e up to g. The character at end index will not be included in the output substring. 2. Find the slice pipe with positive start and negative end index. Slice pipe will return substring starting from index 3 i.e character d and will include all characters before index -2 i.e up to i. 3. Slice pipe with positive start index only. In our example we have index as follows. In the output substring there are all the characters starting from index 6 i.e g up to end. 4. Slice pipe with negative start index only. In the output substring there are all the characters starting from index -6 i.e f up to end. Now find the component used in our example for slice pipe using string expression. Now we will discuss slice pipe with array expression. In our example we have an array as follows. The element at start index is included and the element at end index is excluded in the output. Now find the component used in our example for array expression.